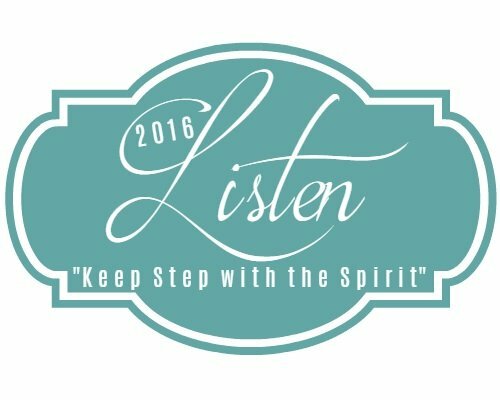 I’m excited to welcome my dear friend and talented writer, Abby McDonald, to share with us today for the Listen Close, Listen Well series. Abby McDonald is a mom, wife and writer who desires to show women the hope of Christ in the middle of life’s messes. 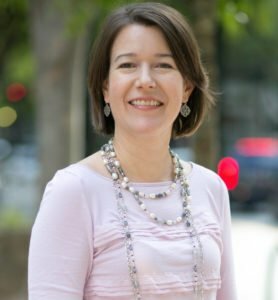 When she’s not chasing her two little boys around, you can find her writing about her adventures on her blog, Fearfully Made Mom. You can connect with Abby on her blog, on Twitter or Facebook. I heard my four-year-old’s shouts from outside the kitchen and stopped cutting the raw chicken in front of me. My oldest child was screaming and holding his forehead in pain, squeals high-pitched like nails on a chalkboard. After taking a deep breath and asking both boys what happened, I learned that little one had come tumbling down the slide while big brother was still on it, causing him to fall on his face. I drug the culprit inside and placed him in the time out chair while he shouted protests, not realizing the strength of my own grip. As he sat there with tears streaming and I continued cutting meat for dinner, I tried to control my rising blood pressure. I wondered if the boys would ever play peaceably together while I made a meal. I also realized, with shock and a little remorse, that my anger over the situation was worse than my son’s. He was the one hurt, but he had gone back to playing happily on the swing set. When I walked my youngest back outside and made him apologize, I saw that my firstborn had already forgotten the incident. “That’s okay, Gabe,” he said, and the two continued going up and down the climbing wall. In the space of five minutes, my son put the past behind him and moved on, ready for the next adventure or game between brothers. I can’t help but think about a child’s uninhibited ability to forgive when I read this verse. And I as I recite those words in my head, I know what God is pressing on my heart. It’s not my children who I have difficulty forgiving. It’s myself. My kids say “sorry” and move on, and I continue replaying a missed opportunity where I knew God was asking me to extend an invitation. My kids say “sorry” and move on, and I continue thinking about something I should have said or done differently. Even after confessing to my merciful and forgiving Father, I hold onto my shortcomings with a grip so fierce it disturbs. It disrupts the rhythm of grace, and comes spewing out in misdirected anger and hurtful tones. We can’t extend grace to others if we can’t accept it for ourselves. We may try. We can put on a happy face and pretend for a while. But eventually, we hit a wall. We run into the chest of our Father, and while we pound our fists against Him He’s asking us one thing. Let go of the past and let Me love you. I have forgiven you. Now you must forgive yourself. 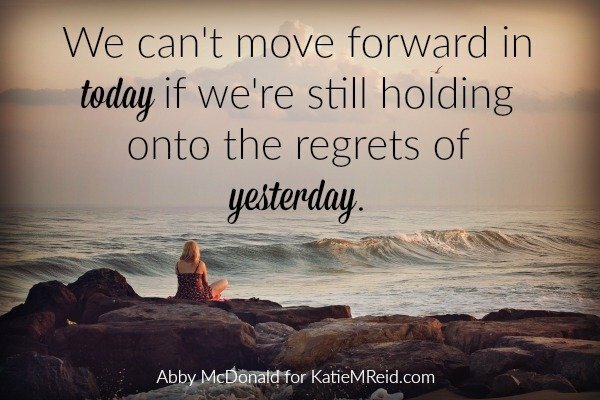 We can’t move forward in today if we’re still holding on to the regrets of yesterday. As I sit here typing this, I’m accepting God’s invitation. I’m laying down the baggage I’ve carried with me, and laying it at the feet of the One who bore all of it on the cross. His grace isn’t for a moment or one day when you miss the mark. It is life, given to be breathed in and lived out with each step we take. Are you living in a moment where you messed up and can’t move forward? Confess it. Hand it over. Then live in the here and now, thanking God for a day when His mercies are new. Thank you for this Abby. I especially relate to this: “We can’t extend grace to others if we can’t accept it for ourselves.” This is a constant area of ‘needs improvement’ for me. God has been speaking to me a lot lately about extending grace. Your post is just one more confirmation:) Thanks friend! I hear you, Kristine. I think as a mom it became even harder because I often see my kids’ behavior as a reflection of me rather than their sinful nature. I’m slowly learning to extend grace to myself. Thanks for stopping by today! Wow Abby, powerful. Children do forgive and move on, but can we? Bitterness is paralyzing sin’t it? Powerful reminders to have the faith of babes! Thank you. Amen, Christy. I often say I think my kids teach me just as much as I teach them. Thankful for you, friend. I could totally relate to this. Thank you Abby for these words! So glad to hear that, Angela! Thank you. Out of the mouths of babes. It’s so amazing how time and experience often grow us jaded rather than wise. So glad God gives us daily opportunity to see grace in action. Oh, for the eyes to see. Love your humble and tender heart, Abby. You always draw us to more of Jesus. You have spoken deeply to my heart with your words here, Abby! Oh, how I need to offer myself grace! But more so, how I want to always offer others grace. Lots to pray over and through! Yes, reading through this post again was a great reminder to me as well, Leigh Ellen. It had been a rough day. God is good that way. Thanks so much for stopping by! I can be the queen of stewing on things. Replaying conversations in my mind. Going back over what I could have done differently. Maybe I could take a lesson, like you did, from your son. Out of the mouths of babes…I needed this today…to forgive and lighten up on myself! !